At Bittersweet Café & Confections, we strive to bring to you the highest quality café products. A lot of care and consideration goes into our product line and you can trust what you encounter at Bittersweet will be fresh, well-made and flavorful. 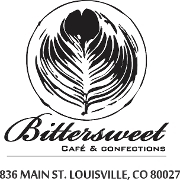 It is with great pleasure that we invite you to visit Bittersweet Café & Confections to enjoy our fine Desserts and Pastries and world-class coffee and espresso drinks. We offer decadent Cakes, elegant Tarts, one of a kind Petit Pastries, Chocolate Macaroons, and a wide variety of decadent gluten-free dessert. For those who don’t have a sweet tooth,we offer more than just delicious desserts and pastries. Bittersweet also offers Breakfast Pastries, Breakfast Burritos, Breakfast Sandwiches, Paninis, Sandwishes, Salads and Soups. If it's a treat you're looking for, Bittersweet Café & Confections has the perfect treat for any occasion or no reason at all.